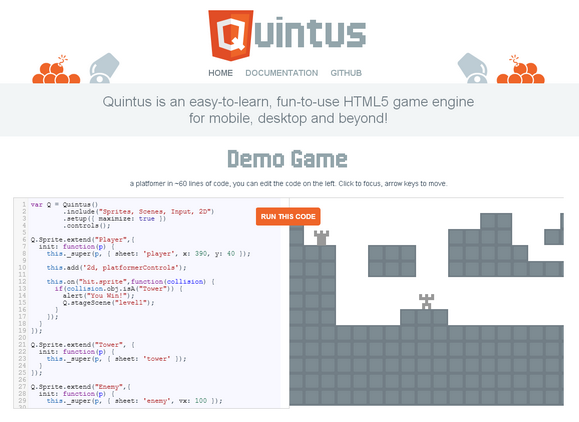 Quintus is an easy-to-learn, fun-to-use HTML5 game engine for mobile, desktop and beyond. Create an HTML file, pull in the Quintus library and setup the engine. Quintus has a modular engine that lets you pull in just the modules you need and can run in multiple instances on a page. Quintus supports an event-based, hybrid Object-Oriented and Component-based approach, allowing for both a standard inheritance model with support for reusable components. Quintus let’s you easily create reusable scenes that can be swapped in and out by loading them onto stages. Stages stack on top of each other. Quintus features easy asset loading, sprite sheet generation.